It will be a busy news week! The economic calendar is full, and so are the the piggy banks of speculators. Despite the massive equity rally, we suspect that most traders missed the move and are sitting on piles of cash (primarily from poorly timed equity market liquidation in mid October). Similarly, the COT report suggests that speculators have liquidated bullish crude and gold plays. In our view, the environment is ripe for a lot of "green" on the quote screen. If we are right, we could see a scenario in which commodities and stocks move higher in tandem. On a side note, we are looking forward to the ADP report in the morning; this will give us an arguably inaccurate glimpse into Friday's government data. Nonetheless, it will be Friday's session that could see fireworks. According to our stats, the 10-year note (considered the benchmark of interest rates) isn't due for a seasonal low until early, to mid-December. Thus, there is still plenty of time for prices to drift lower. Yet, we are getting a plethora of mixed signals. 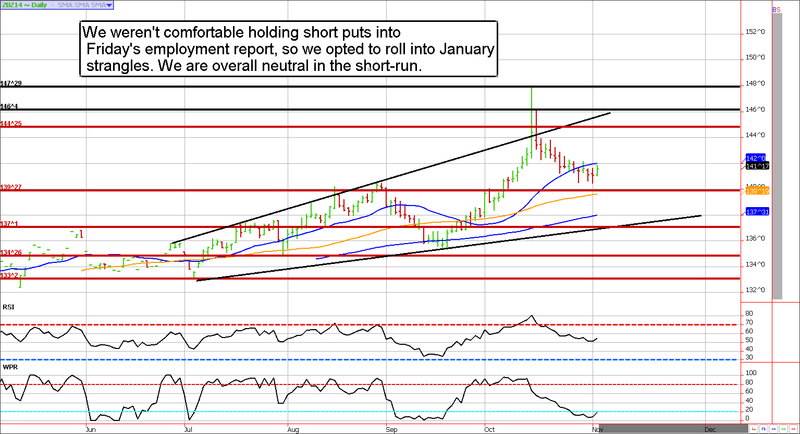 For one, the COT report released on Friday conveys a speculative community that wasn't deterred from their bearish positions by last month's historic short squeeze. Particularly, small speculators are still sitting on over 130,000 net short 10-year note contracts (as of last Tuesday). As we've seen multiple times this year, the more aggressive the bears get the bigger the rallies (short covering). Eventually, the market will fall and speculators will get what they are looking for, but Murphy's law suggests it will happen after most of the shorts have exited the markets in disgust. In addition, the ZB (30-year bond) is already seven to eight handles off of the spike high. On some measures, it is technically oversold. Accordingly, although our overall bias is lower we are neutral in the short-run and probably due for some more consolidation (grind higher) trade. **Consensus:** We're overall bearish, but expecting some near-term strength. We're playing it with neutral short strangles. We are still in awe of the recent equity rally. In more normal times, we'd probably be salivating to put on bearish positions. Yet, this time around we are hesitant. Not because we necessarily believe the fundamentals are gangbusters, but because we've traded holiday markets before and they almost always grind higher. For example, the week before Thanksgiving has seen a positive close in the Dow 15 of the previous 20 occasions. In addition, anybody that sold the lows a few weeks ago hoping for a pullback to get in might run out of patience...thus, we could get into a scenario in which investors are chasing prices higher. Also, don't forget...Novembers have ranked as the #2 month to be long stocks during midterm election years! We are well aware that the rally is a little overheated, but today's back and fill looked like a simple reload before moving into new-high territory. 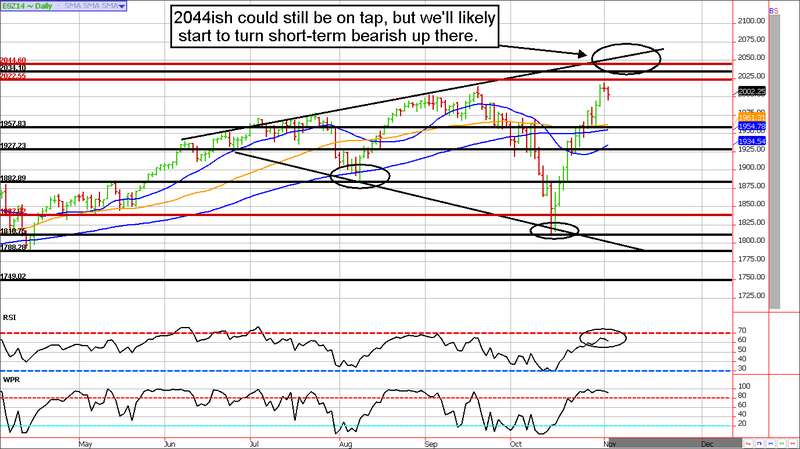 We still have our eyes on 2044ish. **Consensus:** This might be too far too fast, but it probably won't matter. We wouldn't be willing to consider getting bearish until prices see 2044ish in the ES. October 29 - Buy back the 30 year bond 146 calls to lock in profit of about $500 per contract before transaction fees (this goes toward loss on original call sale). November 4 - Buy back December bond put at a small profit, then sell a January 145/136 strangle to establish a neutral short option strategy.